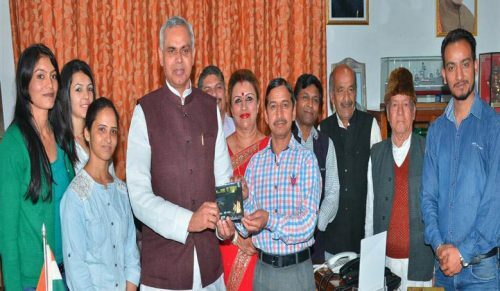 Vijyender Sharma, SHIMLA–Governor Acharya Devvrat released video CD titled ‘Chandniya Rata Ra Nazara’ brought-out by folk artiste Gauri Shankar at Raj Bhawan today. The VCD is a collection of traditional Himachali folk songs which has been directed by Padam Sharma and Namita Sharma and Gauri Shankar has given his voice to all the songs. The Governor appreciated the folk singer for his endeavour and said that such VCD’s based on traditional Pahari songs help in preserving our unique culture and traditions.